St. Francis Generic Drug has its roots from more than 30 years of trusted expertise by the St. Francis Square Group of Companies in real estate and retail. St. Francis Square Group has emerged and become one of the leading businesses in its industry. It gained its prominence when it ventured into retail in the year 2005 by putting up St. Francis Square Mall in the heart of Ortigas. A year after its success in retailing, it has established a generic drugstore—the St. Francis Generic Drug. 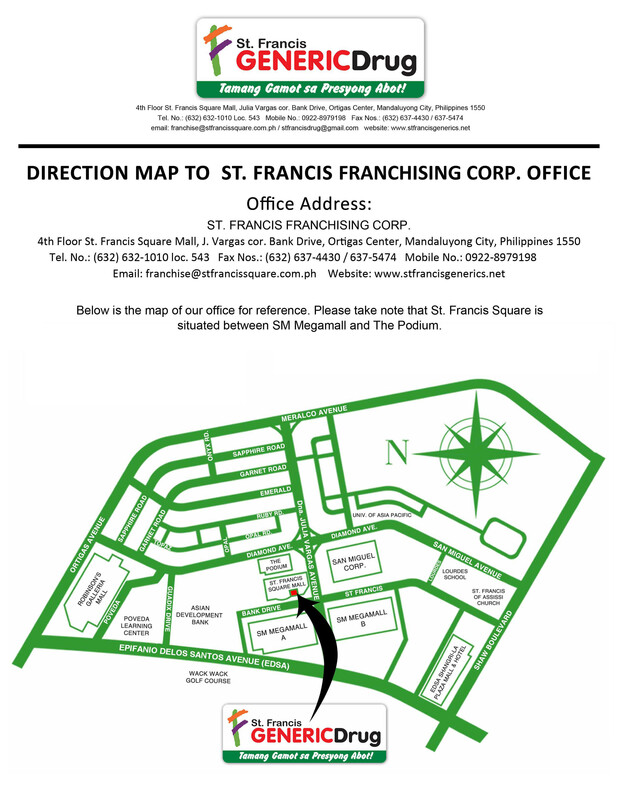 St. Francis Generic Drug was first located at St. Francis Square Mall in Ortigas in 2006. “Tamang Gamot sa Presyong Abot,” is its corporate philosophy that defines the core and purpose of its business. After several years of operational success, it opens its doors to franchising. With the corporate mission to bring affordable merchandise to Filipinos, the St. Francis Group of Companies now offers a more affordable and convenient access to generic medicines. WHY INVEST IN ST. FRANCIS GENERICS DRUG FRANCHISE? St. Francis Generic Drug is brought to you by St. Francis Square Group of Companies which has over 30 years expertise in real estate and retail. 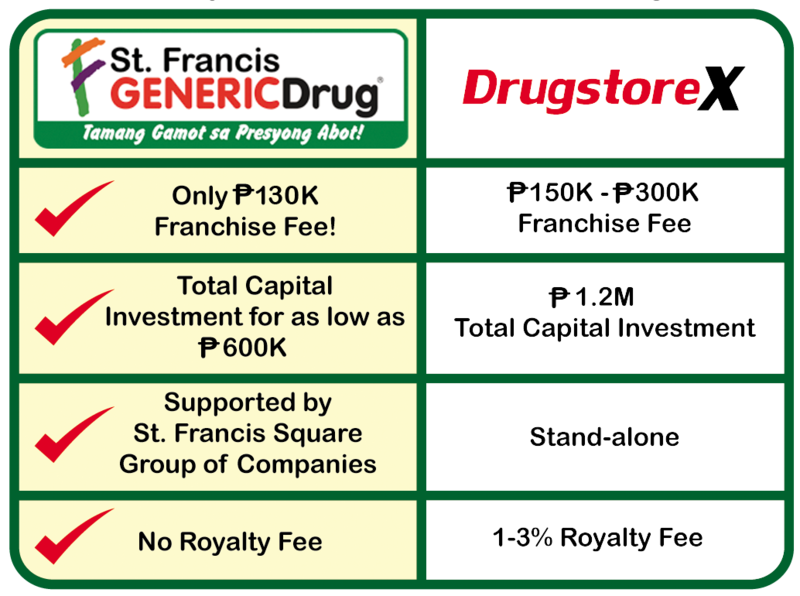 Investing in a St. Francis Generic Drug Franchise translates to an opportunity to enjoy optimum returns from a very affordable franchise package for as low as P130K! Total Capital Investment for as low as P600K! How do I become a St. Francis Generic Drug franchisee? There are 5 easy steps to become a St. Francis Generic Drug franchise. STEP 5: Congratulations! Grand opening of your St. Francis Generic Drug outlet!